1 bottle treats up to 20,000 gal./75,684 liters, 1 pump treats 100 gal/378 liters. Barley straw has been used for hundreds of years to promote clean clear water conditions in ponds and streams. 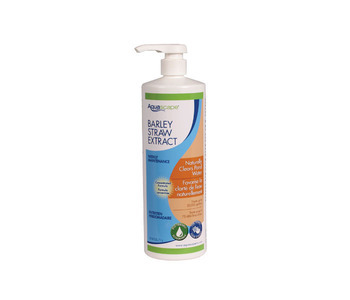 EcoBarleyT Liquid Extract is a pharaceutical-grade, fermented barley extract that has been concentrated to give you a clean clear pond. The added enzymes will help reduce pond maintenance by breaking down pond sludge and keeping filter pads cleaner. Available in four sizes: 250ml/8.5 oz, 500ml/16.9 oz, 1 liter/33.8 oz,4 liters/1 gal. 1 bottle: treats up to 20,000 gal./75,684 liters 1 pump: treats up to 100 gal./378 liters Unit Weight: 2.3 lbs.